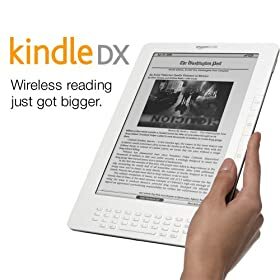 If you haven’t heard, Amazon has announced the Kindle DX. A 9.7 inch Wireless reading device with a larger screen made for reading textbooks and newspapers. Now this is all great news for technology and e-books. But as I listened to the TWIT podcast episode 194 they talked about what this device really is about. More important than the size of this device is that starting with the DX it will allow people to upload and view PDF files. Now this might not seem like a lot but as they said on TWIT and what I agree with is that Amazon has just opened the door to a whole new round of piracy and have backed publishers into a corner to force textbook to be created in the Amazon Kindle format. How so? Well let us pretend for a second we’re in college and you are trying to save that $110 for something more important than a textbook (in college there are many things more important than a textbook 🙂 ). What if you and your buddy could split the cost of the textbook, use one of the scanners in the school, scan the book to PDF and then put it on your Kindle? What if students from other universities did the same and then shared those files using Bit Torrent or P2P Networks basically giving the book away for free. Or how about this….most textbooks are in PDF format before they are actually printed. Much like pirated DVDs it takes one person to post the PDF of the book on the web for download to sidestep the publishers and give that content straight to students. Why hasn’t this happened already? Apple created the iTunes store which with the #1 MP3 player the iPod created both a need (music) with a want (iPod). Amazon has just done the same thing. The need (textbooks, books, newspapers, etc) now has the wanted hardware device…the Kindle. Amazon has just created a whole new round of piracy. So if you are a textbook publisher…or any publisher for that matter what are your choices? A) Continue to pretend that that Kindle does not exist and continue with your model of creating traditional textbooks. Then try to track down and stop piracy through the courts (because it worked so well for the music industry). B) Embrace that media and textbooks have changed that this is the start of an evolution of textbooks and content, and start creating ways for students to purchase their books in Kindle format. Making it easier for them to purchase a book rather than to try and search for it illegally (exactly what iTunes did for the music industry). Has Amazon just changed the game? Will textbook publishers be able to wrap their heads around this fast enought to change their modle? Even the New York Times after knowing that they could save money by giving everyone a Kindle, can’t seem to fully wrap their head around the change. I won’t expect the New York Times to just turn off the printing presses tomorrow, but why not give people the choice? They obviously see this as a way to get more subscribers rather than admit that their subscriber base is changing. Old business models are hard to change…we know this all to well in education. It’s not until they are forced to change that they actually do. It’s not until these businesses are actually backed into a corner where they are loosing money that they decide to change. Can we keep this from happening to education? Or will education as a system follow the same pattern? Ride their business model of how to educate kids to the point that the kids (customers) just don’t show up anymore. Only then will we see real change. Only then will there really be a reason to change education. Until then…what we’re doing is good enough and there isn’t enough pressure from virtual schools or other educational methods to make the model change. In other words what we got is good enough for now…why change. Isn’t the reality that textbooks have only got a short term lifespan anyways? Are we really going to be needing textbooks for too much longer? To me it is similar to an encyclopedia. Why in the world would I consider buying an encyclopedia in this day and time? The way of the olde $120 dollar college text book should be rapidly fading away in my opinion. I hate to say it but the reality of pirated text books is already here. Most text books in Canada come with a PDF copy on a CD. It is a bit cumbersome to work with (multiple files, no titles on the PDFs), but it just takes one person to place it into a correct order and add useful labels. A quick google search actually turns up heaps of PDF text books for high school science across the US and Canada. The future of textbook piracy is already here. So if the Kindle is the hardware that is the tipping point…then does the piracy get worse? I know the piracy is already happening but is the Kindle the piece of hardware that makes it easier to pirate? As the parent of a college student who has paid more that $200 for single textbooks that have little to no return value, weigh far too much,and aren’t used in the classrooms, I think that textbook companies need to get with the 21st century. If it wasn’t the Kindle it would eventually be something else that would prove to be the tipping point.